I am fortunate today to have the wonderful Julie Campbell joining me as a part of her blog tour! Please join me in welcoming Julie as we celebrate the release of her new book, Summer Break Blues. 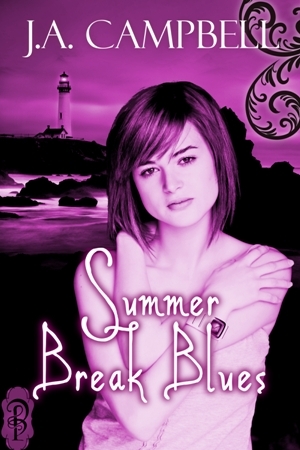 Thank you all for joining me in celebrating the book release of my second young adult urban fantasy, Summer Break Blues. This is the sequel to Senior Year Bites and picks up a few months after it left off with Meg’s graduation from high school. Today we’re going to catch up with the guys, Gary, Tad and Gage. Tad: Yeah, not a vampire. Sorry, Gary. I obviously grew up close to Gary, though I was born in California and lived there until we moved out here when I was ten, shortly before I met Gary. We both met Gage in college. He’s actually had experience with werewolves before coming out here, so we started our little club to keep an eye out for supernatural weirdness. Gage: That’s how we met Megan and her friends. I’m from Montana. I hunt and fish and camp and I’m studying wildlife biology. I saw a werewolf when I was out fishing. You’d better believe I’m lucky to be alive. I pretended I hadn’t seen anything and somehow managed to escape with my skin intact. Tad: I was in love with Wonder Woman. Does that count? Meg is great, but I’m not in love with her. Gary: Got a girl back home. She’s something special. What’s it like being friends with Meg? Gary: She’s a very important part of the Buffy gang. Without her we’d be toast several times over. Tad: She’s really hot when she fights. Well, when she’s not moving too fast to see. Gage: I’m just glad she’s on our side. I’d hate to have to kill her. Meg managed to survive her senior year of high school as a vampire, and now she’s looking forward to a relaxing summer with her friends before trying to tackle college. Unfortunately, some unfinished business from the previous year rears its ugly head and Meg is forced to deal with the Sidhe who are distinctly unhappy that she killed one of their kind last winter. Then Ann’s parents vanish while they are on their annual summer vacation in Maine and it’s up to Meg and the rest of the gang to come to the rescue. Though she is still trying to figure out who, and what she has become, Meg and her friends feel they are up to the challenge. That is until things really start to fall apart. And we also have a giveaway!! And now for the good part. Julie and Decadent Publishing are giving away several books on this tour. You could win your choice of any Decadent/Bono Books ebook including Summer Break Blues, or Senior Year Bites. All you have to do for a chance to win is leave an email address and what format you’d like your book in. (PDF, Kindle or Nook). Julie will contact the winner to find out what book you’d like. She needs this info so she can pass it on to my publisher so they can send you your book and to notify you that you won. Please enter the contest within a week. The contest will run from today until midnight on Sunday, December 9th. Julie will randomly select a winner on Monday, December 10th, and will contact the winner at that point. paravelh@hotmail.com Nook. I haven’t read these, but sounds fun! I have added this one to my wish list.. Thanks for the chance ti win. Three interesting but very different guys. Kindle format please. Thanks for the contest! I like elk steak, too. Hmmmm. I’d like moving or prc (Kindle) if I’m lucky enough to win. Thank you! The winner is Urb! I’ve emailed you. Thank you for commenting!